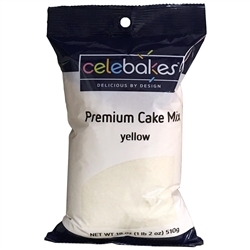 When you’re making a yellow cake, make sure you’re using only the best cake mix with our CK Premium Yellow Cake Mix. It comes in a package of 18 ounces, just the right amount for a cake. It’s also certified Kosher. You’ll find all of the ingredients for this delicious cake listed below – and be sure to check out our cake pans and buttercream icing to go with it! Xanthan Gum, Beta Carotene (Color), Carboxymethylcellulose, Artificial Flavor. Directions: Ingredients needed: 1 Pkg. of Mix, 3 Large Eggs, 1-1/4 Cup Water, 1/3 Cup Vegetable Oil. Notice: This statement is complete and true as of the date of this document to the best of our knowledge. Also, check out our famous Buttercream Icing!